If you come from a crafty family odds are you'll create a crafty family. 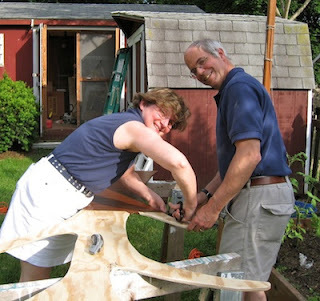 My second post in the being a grandparent series is about our visit to Amy's house to help her with a decorating project. 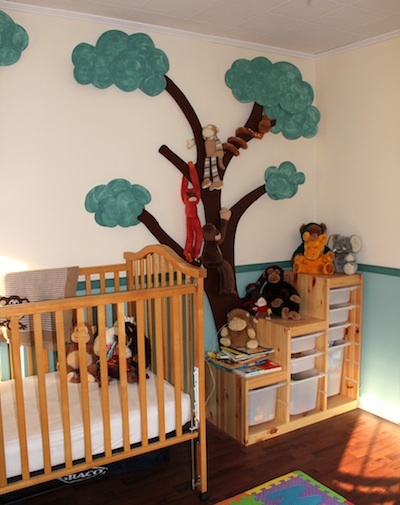 She had designed a jungle theme room for Taylor and wanted two trees on the wall but she didn't want a mural, she wanted the trees to have some three dimensionality and be spaced out a little so all of the stuffed monkeys could reside in the trees. Gramzee and Grandpa were invited to help. 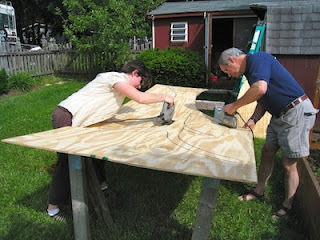 I'll first show a couple of pictures of the finished project so the "how to" photos make more sense. 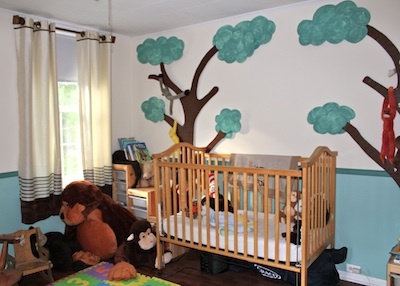 There are two trees in Taylor's jungle and they are painted in the green and brown colors of the room. 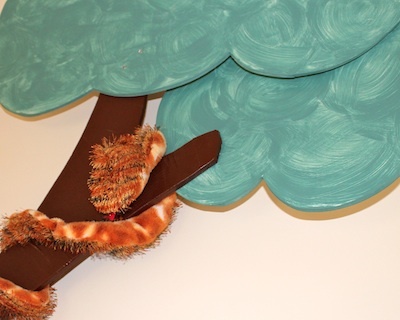 Here is a closeup so you can see how the trees are spaced out from the wall about 1" so the snake can wrap around the branch and monkeys can hang in the notches. 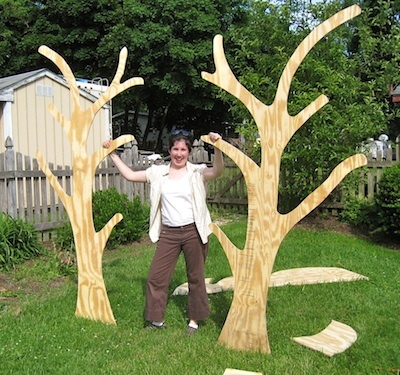 1 4' x 8' sheet of 3/8" plywood for each tree. animals to populate the jungle! • Amy sketched trees onto the plywood using a black marker. • The plywood was placed on two saw horses and she enlisted assistance in cutting along the lines using the electric jig saw. Taylor's Grandpa helped! • Cutting is done and two trees are standing. • The plywood was cheap construction grade and very splintery. Edges were sanded and then rounded over. • Amy wasn't sure how she wanted to finish the "bark." I knew the edges would be a problem and I could see future slivers in little boy hands. I had found brown duct tape and brought 2 big rolls to the party. 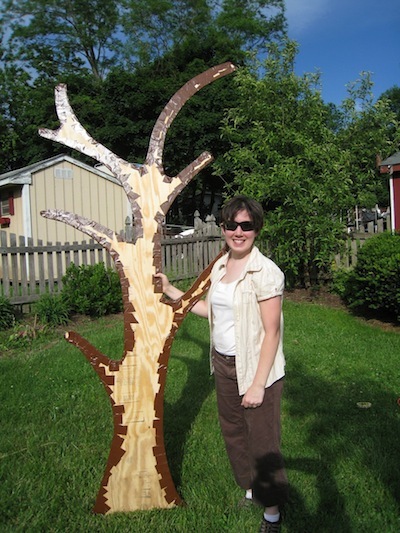 • The original thought was to wrap the tree skeleton in brown tape but it was clear that it was easier and looked better to piece it together, overlapping each row as you worked up the tree. 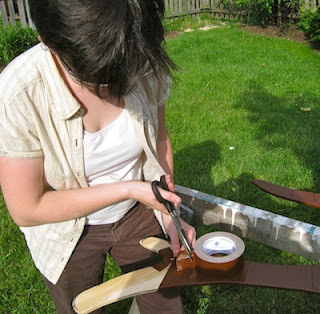 • It was a great job for two together with one laying the tape and the other using the scissors. The duct tape is extremely sticky. • The backsides of the trees aren't very attractive but they can no longer be seen! • Amy then cut some puffy shapes out of some leftover foam core board. • Using dry brush techniques (not too much paint on the brush) she painted the puffs with lose brush strokes using paint leftover from painting the bedroom. • The trees were mounted on the outside of the baseboard. Scraps of wood were placed behind the tree and it was screwed to the wall with the 3/4" wood spacers behind them. • The leaf shapes were stuck to both the front and the back of the wooden branches using double stick carpet tape. • Assorted animals moved right in! Other Notes: Amy is also a blogger. She writes about living frugally at Coupon Tipster. Yes, it was, and flexible. Hard to make a mistake. Taylor is now 4 and the trees are still on his bedroom wall!